When we look at this mountain, we suppose that it is stable but it actually moves some millimeters every year, therefore God be He exalted said: (And you will see the mountains and think them solid, but they shall pass away as the passing away of the clouds. The Work of Allah, Who perfected all things, verily He is Well-Acquainted with what you do) [Surat An-Naml, verse: 88]. God be He exalted says: (And you will see the mountains and think them solid, but they shall pass away as the passing away of the clouds. The Work of Allah, Who perfected all things, verily He is Well-Acquainted with what you do) [Surat An-Naml, verse: 88]. The explicators said about this verse that it will happen on the day of resurrection, as the mountains are going to walk, but Al-Sheikh Al Shaarawy may God have mercy on him said that on the day of resurrection there are facts and there is no field for suspicion and assumption. So Almighty God says: (we suppose) which means we assume, and on the day of resurrection, we see the facts as they are so there is no field for suspicion. Therefore the verse talks about a worldly truth which is the movement of the mountains. Al-Sheikh Al Shaarawy also said that when we look at the earth from the outer space, the most important thing that distinguishes the earth is its high mountains that appear like small dots that revolve and move with the earth according to its rotation around itself. Therefore this verse is considered to be evidence on the earth's rotation. 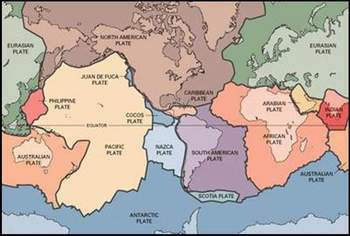 The previous explanation is true, but scientists have discovered another movement of the earth plates, so the earth crust isn't stable, the crust is the outer layer of the earth, and the scientists have found that this layer is divided into groups of plates and these plates are in continuous movement and displacement. 1-The verse refers significantly to the movement of the earth and its rotation around itself. So the one who looks to the earth from the outer space, recognizes the movement of the mountains while the one who lives on earth never feels it. 2-The verse refers to the movement of the earth plates, so scientists have found that the mountains together with the earth crust have a continuous slight movement and we don't feel this movement. So Glory to God Who told us about these facts!